Digitally accurate and fully programmable, SRD-Series systems utilize state-of-the-art PLCs and servomotor-control for the rotary gear metering pumps. Optionally, coriolis mass flowmeters are included for superior, closed-loop feedback ratio control. If needed, you can easily select preset pour recipes for each of your parts by name or number at the LCD or PC-based operator-interface touchscreen. You set digital presets for your process control recipes, including ratio, shot-size, output rate, temperatures, vacuum and mixer-speed, at the touchscreen interface. And the interface is menu-driven for easy operation. 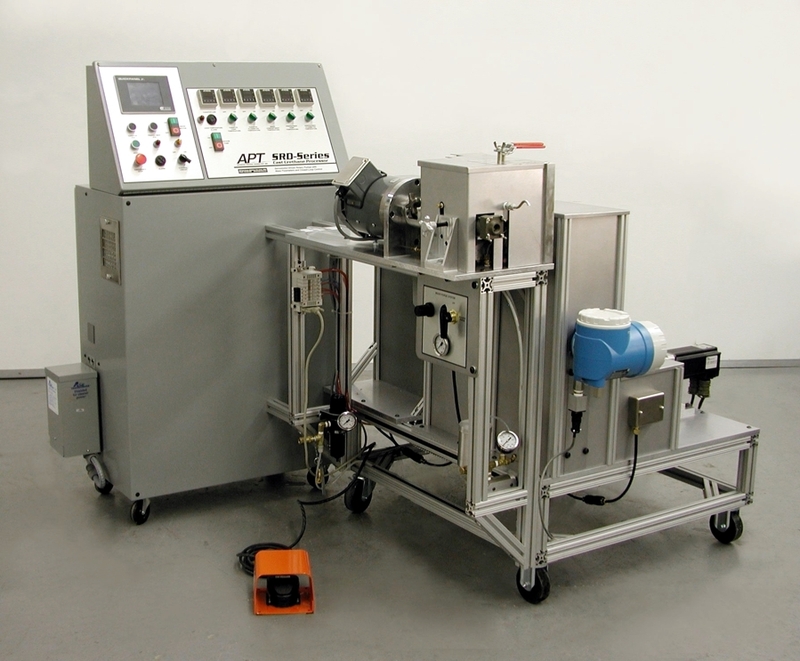 SRD systems meter, mix and dispense unfilled cast urethane elastomers, epoxies, polyesters and vinyl esters, among other flowable formulations. Cast and injection-molded products include golf balls, wind turbine blades, wheels, MRI magnet coils, paper-making rolls, hydrocyclones, advanced composite aircraft components, cast transformers and sonar- absorbing submarine hull coatings. Each of the positive-displacement rotary gear pumps on the SRD-Series system is of the highest quality available and each is driven with an independent, digitally-controlled servomotor drive. The rotary pumps handle cast urethanes, epoxies, polyesters and cast nylons. 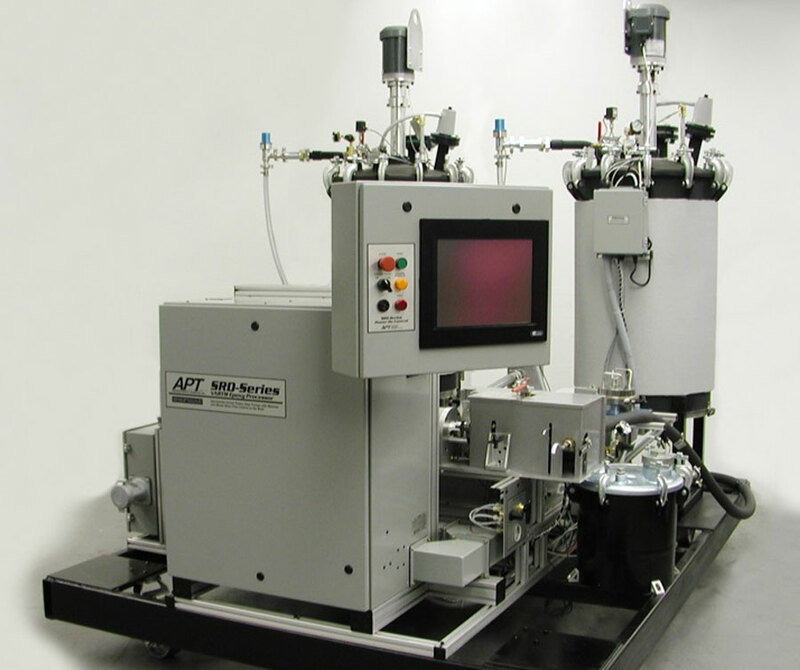 Open-casting, VARTM (Vacuum-Assisted RTM) and closed-mold RTM resin injection applications are also handled. Metering pump sizes are selected to match your ratio and output requirements. Accurate ratio settings are made by entering your required ratio at the LCD operator-interface. Typically, presets are also entered for shot-size, output- rate and mixer speed. You can save those presets to the PLC as process recipes for later use or you can enter and run each set of presets without saving them. Hundreds of recipes can be saved. When the footswitch is depressed, the the servomotors turn the rotary pumps, displacing on-ratio streams of A and B component materials to the static (motionless) or dynamic (motor- driven) mixer. Various systems provide outputs from 1 to 50 lbs/min. Ratios can range from 1:1 to 1:200. Two, three and four-component systems are standard and automatic color- component metering with one or more color pumps is standard. Constant positive material feed pressure from the degassing tanks feeds material to both pumps. This positive air-free-material pressure from the tanks is created by nitrogen over-pressure in batch vacuum tanks or by mechanical feed pumps on constant-vacuum thin-film degassers. These mechanical rotary (or piston-type) feed pumps are submerged in the material or they are mounted below the degassing vessel’s center bottom outlet for easier and cleaner access to the pumps. Continuous recirculation is optionally provided at the mixer to keep the material in constant motion; continuously diverting the independent on-ratio streams of material back to their respective material supply vessels whenever the machine is not in pouring mode. The automatic component injectors (2-way and 3-way valves) are located at the mixer and convenient ratio- taking ports (for manually checking ratio) are provided. See our optional Mass Flowmeters for automatic ratio monitoring and ratio correction, described below. All heated compartments for the pumps and the mixer are made of removable slide-out panels for easy access to all system components. Heaters are ceramic-enclosed infrared type, which allow the system to be more easily modified at a later date to include third and fourth components or to simply switch to different rotary pump sizes. SolidWorks 3D advanced assembly modeling software is used to design all of our metering, mixing and dispensing systems, including these SRD-Series systems.